Jen began her career in Alaska over 20 years ago, as a guide on land and then as an Expedition Leader on small ships. Most of Jen’s early work was spent traveling around various parts of the Pacific Rim. In 2008, Jen was hired by Lindblad Expeditions as an Expedition Leader. She worked on expeditions over the next five years in coastal North America, Europe, Antarctica, and Southeast Asia. 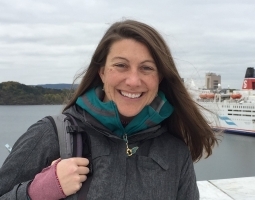 In 2012 Jen was still leading occasional voyages but took over hiring and managing a diverse expedition team, eventually becoming Lindblad’s Field Staff Director. As Director of Field Staff & Expedition Development, Jen’s current role combines the management of the expedition team with itinerary development around the world. She also still finds herself leading the occasional voyage, including most recently in the South Pacific and soon in the Russian Far East.